I felt compelled to write about my childhood for the sake of coming generations. The way of life for the small family farm has disappeared, but will not be forgotten. Eric Weidler grew up on a small family farm where he learned about the good and the bad of life, through mistakes, triumphs, and hardships. 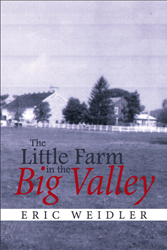 In his new memoir, “The Little Farm in the Big Valley,” Eric Weidler discusses his experiences and memories growing up on the small family farm in order to shed light on a time period that is lost but not forgotten. These memories should be related to subsequent generations so they can understand the true meanings of family, childhood and hard work. “I felt compelled to write about my childhood for the sake of coming generations,” Weidler said. Weidler guides readers through his childhood memories of mistakes and struggles, as well as happiness and education. This memoir is filled with stories of three generations, tragedy, music and days that would go down into history. Author Eric Weidler is a retired schoolteacher and US army veteran. Eric and his wife are parents and grandparents to five children and grandchildren. He enjoys reading children’s literature and various authors who have written of childhood. The author currently lives near Reading, Pennsylvania.